The New Jersey State Quarter was the third quarter released under the 50 States Commemorative Coin Program Act and the third quarter issued in 1999. The theme of the coin is Crossroads of the Revolution and it was released on May 17, 1999. 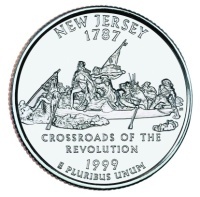 The coin features a design that was based on the 1851 painting, "Washington Crossing the Delaware". The original artwork was painted by Emmanuel Leutze, and now hangs in the Metropolitan Museum of Art in New York City. On Christmas night in 1776, during the Revolutionary War, General George Washington and members of the Colonial Army crossed the Delaware River in hopes of surprising the enemy. Washington figured that the enemy would not be expecting an attack during such horrible weather as the Delaware River was frozen in many places. General Washington was correct and the Colonial Army was able to surprise the enemy, secure the town of Trenton, NJ and capture over 900 prisoners. They were also able to secure Princeton, NJ in the same way later that night. Securing these victories gave the Colonial Army a reason to be hopeful with newfound courage and confidence. It also gave them food, ammunition and supplies that were desparately needed to survive the harsh winter on 1777. A 15 member New Jersey Commemorative Coin Design Commission was formed for the selection of the New Jersey Quarter. It was comprised of people with backgrounds in history, art, and numismatics. The Commission chose 5 designs which were sent to the United States Mint by the governor of the state. Of the 3 that were approved by the Secretary of the Treasury, the "Washington Crossing the Delaware" design was chosen and approved by the governor as the new state quarter design. This coin became the first ciruclating coin to feature George Washington on both sides of the coin. Below is a table showing the design specifications and mintages of the New Jersey State Quarter. Note: The modification moved some of the wording from the reverse to the obverse to leave the reverse available for the state's design. Reverse - Each state theme was proposed, and approved, by the governor of the state. Final design was created by Alfred Maletsky. His initials appear at the back of the boat on the right side of the coin.